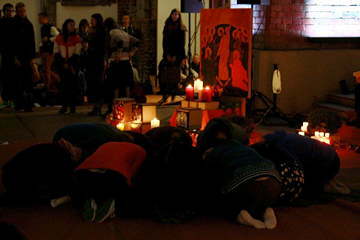 From 26 to 28 September 2014, a gathering led by the Taizé Community was held in Riga, the capital of Latvia. For several years, the Lutheran and Catholic archbishops had extended an invitation. It was during the Strasbourg meeting that the news was confirmed by Brother Alois: an upcoming stage in the pilgrimage of trust on earth would take place in Latvia five years after the meeting in Vilnius, in neighbouring Lithuania. 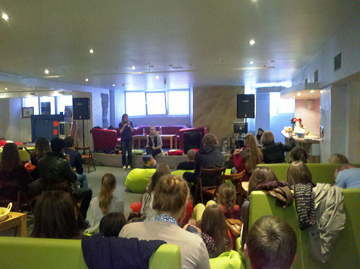 It was fantastic how many young people came to our hometown of Riga. As a volunteer I was excited and thrilled to be a small part of these three beautiful days.I experienced great trust and love from these young pilgrims. Being together in prayers in Old St Gertrude church and in St Peter’s, meeting new people and seeing friends from Taizé made me realize that God is working wherever we go or live. I think that after these days we have more hope in Latvia and in Eastern Europe than ever before. In addition to young Latvians, several hundred participants came from the other Baltic countries, Ukraine, Poland, Belarus and Russia. 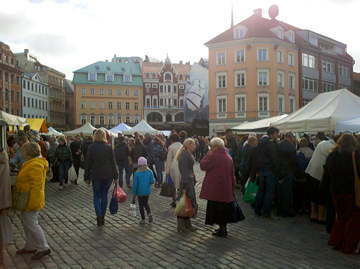 Still others came, in small groups or individually, from various European countries. When we got to Old St. Gertrude Church, where everyone was welcomed at first, we experienced a feeling of hospitality, warmth and joy. 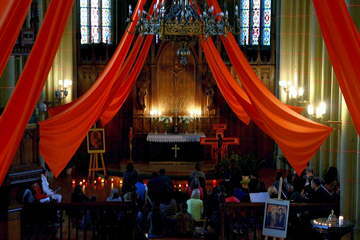 The organisers of the Riga meeting managed to recreate the special Taizé atmosphere in this place and we suddenly felt at home. It is our first meeting outside of Taizé and we are looking forward to share our faith and opinions with others and to contribute to an enriching experience. My host was a young woman about my age who welcomed me to her small flat. We discovered many similarities between us, despite our different lives. She had a lot of questions about faith and religion and I have a view on religion she was not used to from her country. We sat up in the evenings, drinking tea, discussing religion and what makes you a Christian. It was very interesting. I encouraged her to come to the Taizé prayer in St. Peter’s church on Saturday evening, and she really liked it. Especially with the candles. 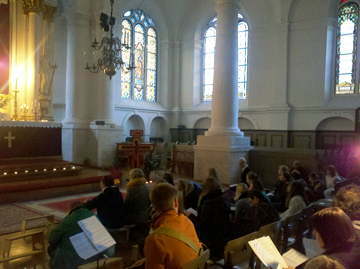 For us brothers of Taizé, it is a joy to be in Riga for this stage of the pilgrimage of trust on earth. […] We would like first of all to thank those who are welcoming us. Among the gifts that God has given to Latvians, there is that of hospitality. And young people of the Baltic countries still have many other values to share. We look forward to being able to discover them. 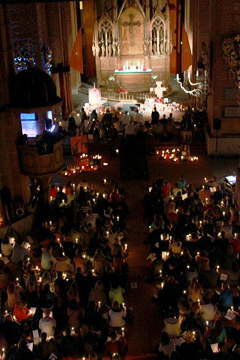 Throughout the weekend, the central place of the meeting was the Lutheran Church of St. Peter, in the historic center of Riga, where the times of prayer were held. On Saturday night, both the Catholic and Lutheran archbishops, Janis Vanags and Zbignevs Stankievics, greeted the participants in the meeting. A representative of the Orthodox Metropolitan of Riga was also present, because the Orthodox Church supported the meeting by leading two workshops and welcoming the participants at the Orthodox liturgy on Sunday morning. Baptist and Methodist communities also participated in welcoming the young people. On Saturday afternoon workshops were held on a variety of topics, including: "Silence and inner prayer" with the Lutheran archbishop; "Unity, reconciliation, community" with the Catholic archbishop; "Introduction to Orthodox iconography", "Serving the poor." During our two workshops, we were glad to see that people were sharing their thoughts and doubts. There is still a lot of uncertainty and young people need the encouragement which comes from trusting God and God’s promise to us. But we also realized that they are willing to take that first step towards becoming peacemakers in their communities. The first step does not have to be a grand gesture or an act of great influence; it can be a simple conversation or just the willingness to listen to those who have hurt us. It is amazing that through listening to the experiences of other people and sharing our own we came to the same thought that Brother Alois later expressed in Sunday’s prayer – peace and reconciliation first of all start with each one of us. After the meeting in Riga, and especially after discussing the meaning of “becoming the salt of the earth” and attending the workshop about reconciliation in society, I started to reflect a lot. What can we do as just ordinary people to make this world what it’s supposed to be? One of the biggest dangers in conflicts between people, nations and/or ethnicities is the dehumanizing of the other side. I think that only when we start treating the other person or group as actual human beings can we reach reconciliation. These days we share the joy that comes from God, but we do not forget that each of us also carries with us a burden, sometimes a very heavy one. For some it is personal suffering, for others an absence of future prospects, still others carry with them the burden of their own people. I think especially of those from Russia and Ukraine. . […] What brings us together these days in Riga? In a world where we see so many conflicts, armed ones or not, we have come as pilgrims of peace and trust. We experience the joy of being together in great diversity, and of feeling deep solidarity. We thank God for bringing us together, beyond borders and cultures, in a unique communion which is the Church. During one of the prayers I understood how happy I am to be among people who are joyfully praying to the Lord together, where we forget about division and enmity. Again and again I saw that a simple friendly attitude, welcoming and hospitality, helps us to overcome prejudices. Common prayer in our own languages was a sign of friendship. It was a visible part of the meeting. The invisible part is the experience of God’s presence so close to our hearts. In our region we have lots of hard feelings due to a complicated history of relations and even to some ongoing conflicts. So I went to the meeting in Riga hoping for a miracle – of just being together before the Lord. Not judging, but praying. Together. And for each other. And I’m thankful to the organizers of the meetings for not pretending that those issues are not important but speaking of them always with great care and tact. Besides, in the context of the situation in the region, singing together in Russian at a meeting in Riga – despite those difficulties – was a sign of hope for me. Since we first visited Latvia in May 2014, during our two and a half week visit there I could see and feel the big desire of Latvians to have this meeting – the desire to share, to welcome others, to be known and to create new bonds in the human and Christian family. It’s a great joy these days to be here and to see that the meeting is taking place – to see familiar faces radiating so much joy, the church full of young people and to feel the unity beyond our limits. As always, this meeting is a great sign of hope for those who are directly or indirectly involved. We are very happy to be back in Riga! As volunteers from Taizé we were in Latvia in May to inform and invite young people to this Baltic Meeting. And now the meeting is taking place with a beautiful atmosphere. Latvians are very happy to welcome people from different countries. We pray together, sing together, eat together – everything “together” in God. It is very beautiful to see and feel this. God bless us and let us be attentive to each other always as we are now.